With SBI’s SparQ™ Cumate Switch System, you can get inducible gene expression in mammalian cells with a range of cloning and expression lentivectors. The pCDH-CuO-MCS-EF1α-GFP SparQ™ Cloning and Expression Lentivector (Cat.# QM511B-1) is a dual promoter vector that drives your gene-of-interest or miRNA-of-interest with the inducible cumate switch promoter, and constitutively expresses GFP from an EF1α promoter. With SBI’s SparQ™ Cumate Switch System, you can get inducible gene expression in mammalian cells through the binding of cumate, a non-toxic small molecule, to CymR. CymR can be delivered to cells on its own lentivector (Cat.#s QM200PA/VA-2 and QM300PA/VA-1), or on the same lentivector as your gene-of-interest (Cat.#s QM800A-1 and QM812B-1). Expression levels of your gene-of-interest are tightly controlled and increase with increasing cumate concentration until maximum induction is reached—see as much as a 32-fold increase in gene expression. Even better, induction is reversible, so you can turn expression levels on and off. Delivering negligible background expression in the absence of cumate, the SparQ System is an excellent choice for achieving controlled levels of gene expression. CymR has a high binding affinity for cumate and, as more cumate is added, fewer CymR molecules bind to the CuO sequences in the promoter resulting in increased expression. Exhibiting much lower background expression than similar systems, SBI’s cumate-inducible vectors can provide up to 32-fold induction of gene expression. Figure 1. Get lower background and higher induction with the SparQ Cumate Switch System than other inducible systems. Figure 2. 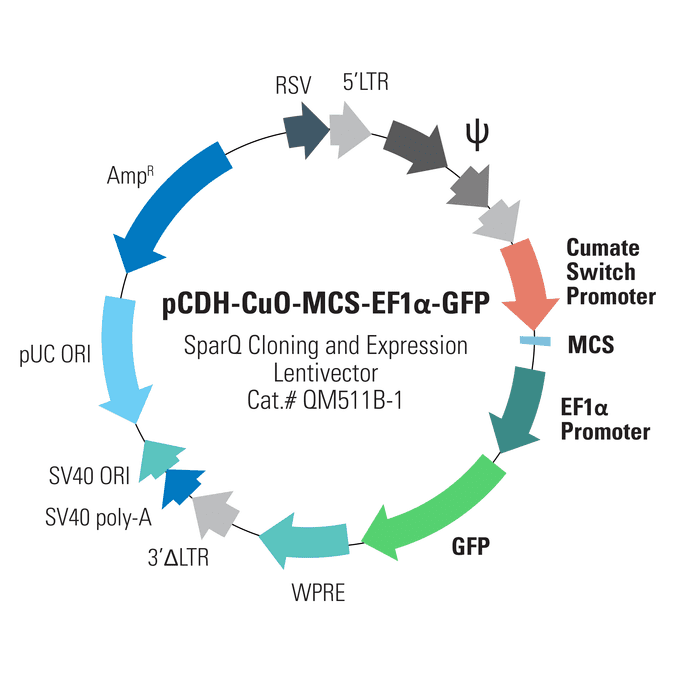 Gene expression with the SparQ Cumate SwitchSystem can be turned on and off, then on again. Figure 3. Gene expression with the SparQ Cumate Switch System is titratable, with increasing amounts of cumate inducing a linear increase in gene expression. Figure 4. With the SparQ System, gene expression can also be titrated by increasing the amount of transduced SparQ lentivirus, even up to 30 MOI.